All good designers understand how important it is for a kitchen to have "visual moments"—unique and striking visual elements that serve as focal points to anchor the entire design. How and where these moments pop up depends heavily on the orientation and characteristics of the space itself. From the actual size of the room to the existing structural features, very few kitchens are the same. But one element that many kitchens have is a window or two, and how this feature is used can be crucial to a great kitchen design. Almost every room designer loves the luxury of planning around one or more kitchen windows. Given the heavy presence of cabinetry lining the walls, a window offers welcome relief for the eye, as well as the obvious benefit of letting natural light into the space. Natural light brings a dose of real life to a room that no artificial lighting can replicate, and kitchen designers always look for ways to accentuate a window in one way or another. 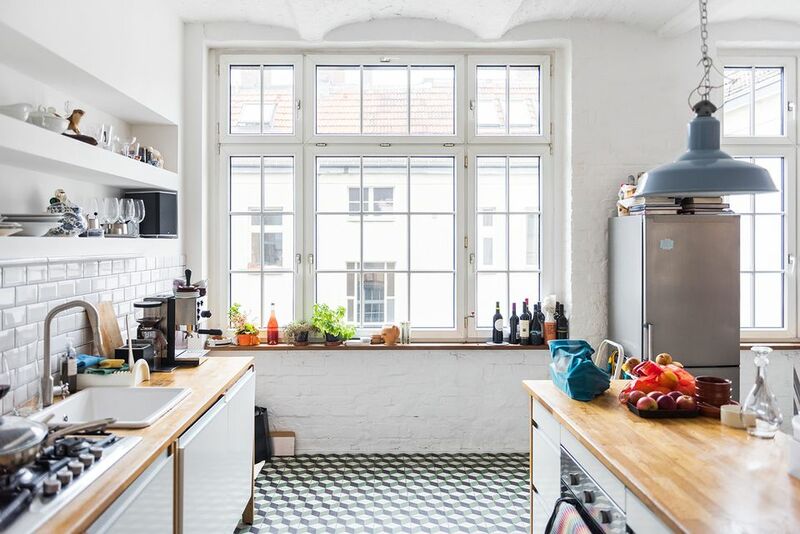 The classic way to use a window in a kitchen is to situate the sink beneath it since almost everyone enjoys looking outside while washing dishes or preparing food. But there are many other ways to bring a kitchen window to life, and most involve moving the interest up to eye level. In the hands of a good designer, the visual moment offered by a window is often as much about beauty as it is about function. If you have multiple windows in your kitchen, consider using the windows to frame a distinctive feature, such as the range hood. This technique can work amazingly well in kitchens that have commercial-grade cooking ranges and designer range hoods. Framed by windows, this feature can create an entire focal wall that anchors the kitchen design, especially when that wall is highlighted with a special surface treatment, like black subway tile. In this example, inspired industrial shelving installed over the windows amplifies the visual punch. Kitchen sinks and range hoods are common features to frame with windows, but just about any important feature can be highlighted, such as a butcher-block baking center, a wine rack, or an eating nook. Taking the idea of highlighting the range hood (or other significant feature) a step further, consider a custom-designed range hood that is tailored to integrate with the windows, as demonstrated in this kitchen. Here, a window is positioned over the custom hood, with two additional windows framing the sides. A complete remodel may offer you unique options for using windows—don't be confined by what is traditional in a kitchen. 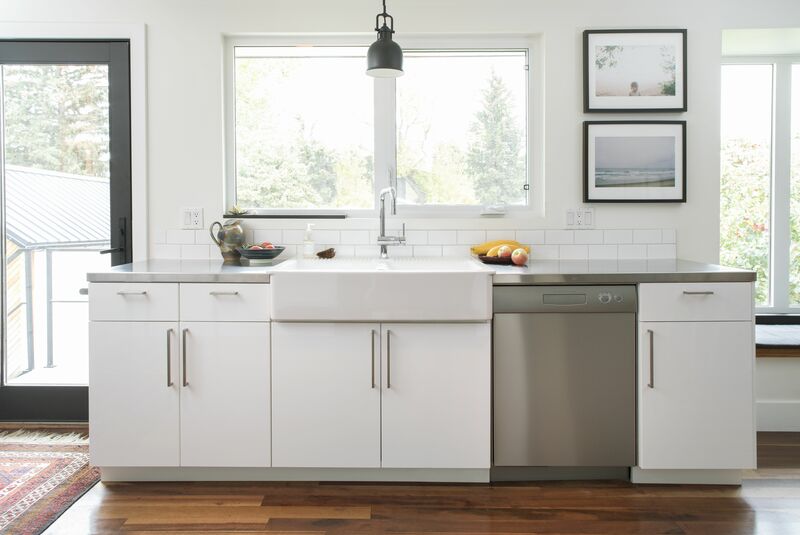 Windows framed with steel or steel-look aluminum are dramatic in any room, but especially the kitchen. A natural for modern decor, they can also be used effectively with traditional cabinetry and accents. In this example, the black metal windows offer a striking contrast with the lighter-colored cabinets. They might work just as well with gray or another dark cabinet color, where the effect would be complementary rather than contrasting. If new steel-framed windows are not in the cards for your remodel, consider painting the existing mullions on your wood windows to achieve a similar visual effect. Cabinetry plays a huge part in the kitchen, and integrating the cabinetry around a window can create a fluid and custom look. In this example, a cabinetry valance was installed to bridge the two wall cabinets flanking a large center window. This particular valance mimics the curve of the window itself, creating symmetry and maximizing natural light from the window. A great option is to let your kitchen window assume a decorative function through the use of unique sashes or ornamental glasswork. This approach works especially well if you have just a single window, often over the sink, where design options are limited. Making this single window stand out with decorative mullions and leaded or stained glass creates an instant focal point in the kitchen. This technique has been used for years for windows positioned over the tub in the bathroom, so why not try the same in your kitchen?